I’m a gadget guy. Give me something new and different and I’m pretty happy. I’m also someone who likes to help out friends. So when Isaiah Coberly approached me and told he’d invented something I got excited. I’ve known Isaiah for over twenty years. He’s one of the most hard working and creative people I know. I invited him to participate in this week’s 5 Question Friday so he can share his invention and vision with you. 1. What is New Pencil? NewPencil Inc. is Tacoma based company that I started to facilitate my inventing and the licensing of my inventions. 2. What is the FipSteady? 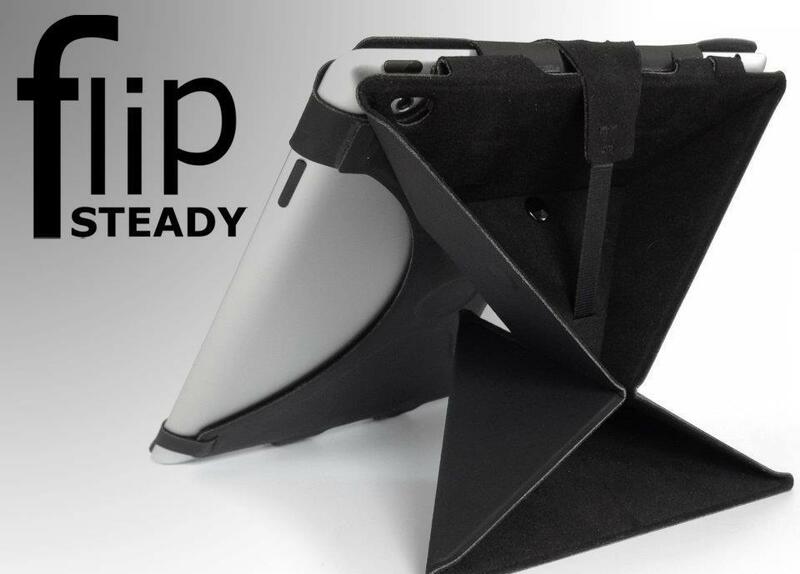 The FlipSteady is a combination flip cover and stand that rivals the iPad Smart cover for the iPad2 and the New iPad. You might say, “If Apple’s Smart Cover is Smart, the FlipSteady is genius.”. 3. How did you come up with the FlipSteady? I started developing the FlipSteady on April 13 2011. It started by folding a piece of paper and having a moment of eureka. I graduated to Cardboard and duct tape and fastened the product to a tablet computer. I was surprised by how versatile the stand was and started developing the product further. After several iterations of trial and error and testing materials and processes we now have the FlipSteady available for preorder from our Kickstarter project exactly 1 year later. 4. What was the biggest difficulty in the development of the FlipSteady? Finding the time to dream and develop the product while juggling clients, relationships and spending time with my three children. Prototyping and coming up with solutions and new ideas was the easy part for me. 5. What are your plans for the future of New Pencil? I foresee NewPencil creating several inventions that span industries and applications. NewPencil will also play a role in educating young local inventors to realize their ideas and teaching them to use high tech equipment in the process. This entry was posted in 5 Question Fridays, Tacoma stuff and tagged FlipSteady, iPad 2, iPad 3, iPad cover, iPad stand, Isaiah Coberly, NewPencil. Bookmark the permalink.